One of gbXML’s drawbacks, however, has been that for complex geometry projects there was no way to cleanly grab information from a parametric environment and pull it into engineering software. Now there is a plugin for Grasshopper called Grizzly Bear, which will allow Rhino and Grasshopper workflows to be more inclusive of engineers who specialize in energy simulation and heating and cooling loads, without awkward translation steps between multiple software packages. Anything that can be drawn and meshed in Rhino/Grasshopper is now directly linked to your engineering software via Grizzly Bear. What is even more exciting for those deep in the software coding community is that there is a new gbXML API that is now open source and available on GitHub.com. This means that you can create your own gbXML creation tools using the API, or make code contributions to the existing API if you believe you have something worth adding or improving. Grizzly Bear is built on top of this API. This new development brings the flexibility of Grasshopper and Honeybee to manage different types of geometry, assigning constructions, schedules, etc. The video below shows an example of how Grizzly Bear is used to export multiple zones with double curvature surfaces and interior walls and openings. 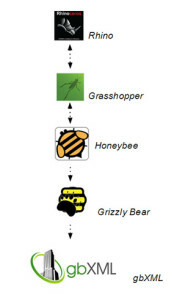 If you want to learn more about gbXML and Grizzly Bear, I strongly recommend that you watch the semi-annual gbXML webinar (http://vimeo.com/105181990).